The daffodils are still out in Loweswater and probably will put on a good show for Easter. Several guests have remarked that there has not been such a marked difference in the flowering times between the South and here this year which is quite interesting, maybe they had it colder than us this winter. 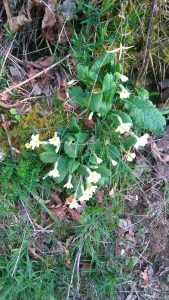 The daffodils have now been joined by primroses and there are also a few shy violets to be discovered. There were even some bluebells which were almost out along the lane today. A neighbour had some swallows inspect her barn last week which she says is earlier than last year. 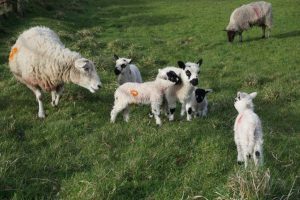 We are also starting to get some lambs in the fields around Foulsyke and there are some beautiful ones at the end of the lane, I am told they are Kerry Hill sheep – very pretty. 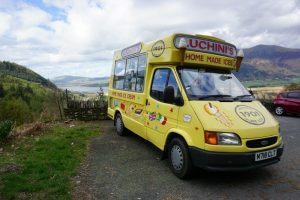 Another sign that Spring is really here is having Tony and his icecream van, looking very pristine, back on Surprise View on Whinlatter – the best ice cream there is! I have been promising myself for ages to go to the Henry Iddon exhibition at the Keswick Museum and I finally made it today! Henry Iddon has done a series of photographs, many of them of climbers using the Abraham brothers Instanto camera. It is a fabulous exhibition, beautiful photographs and the actual camera is on display. I knew it was large and cumbersome but I was still surprised by how big it actually is. How the Abraham brothers got it up onto the climbs is almost beyond belief. There was also a small room with short films (and a snoozing old lady – not me!) One of the films was of the Abrahams brothers climbing Napes Needle, incredible footage. Apparently when they started climbing they used their mother’s washing line – and there’s a photo to prove it. The exhibition is on until mid May – well worth a visit. Another fascinating ‘must see’ exhibition is ‘The Word-Hoard, Love letters to our land’ at Wordsworth House in Cockermouth. This is an exhibition of photographs by John and Rosamund Macfarlane, curated by their son, Robert Macfarlane, illustrating the language that evolved to describe the world around us. Many of the photographs are of local places and as well as many old dialect words there are some amusing modern terms such as Witches’ Knickers for plastic bags caught up in trees. The exhibition is on until September. 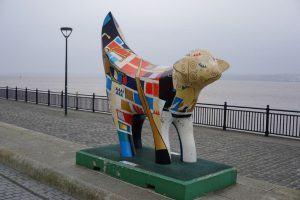 I went on a visit to Liverpool the other week and found some sheep, superlambananas, which reminded me of last year’s Go Herdwick sculptures: as they were sheep I obviously couldn’t resist taking a picture.